This however is the revised and expanded edition and coming it at 658 pages long its certainly one of the longest tomes out there. Length however is not the important factor with military history books, it’s the content we are interested in. The book is written by David B Gordon and is one of a series of three, the other volumes covering weapons and uniforms. I have seen mixed reactions to these books, the reviews on Amazon are glowing but some of my fellow collectors do not rate them so highly. 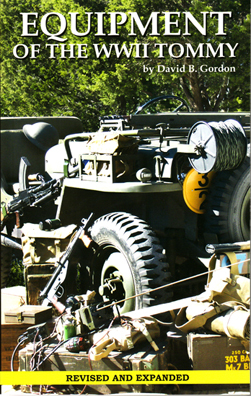 This book certainly does what it says in the title and goes into detail about many items of British WW2 equipment, starting with webbing and then going on to look at rations and eating equipment, signalling items, optics, load carrying equipment and many more areas. This book certainly covers a lot of ground and it is profusely illustrated with both period photographs of the items in use and modern pictures of surviving artefacts. I will hold my hands up now and say that I certainly learnt a lot from this book and in many cases it seems to be the only thing out there covering the more obscure items. I have never seen details of the 3” mortar carrying harness, dixies, volt- testers and a variety of other pieces of specialist equipment before. All in all then this book appears perfect…sadly however it never quite delivered for me. The author has clearly gone into a lot of detail about a great many items, but there are annoying and puzzling gaps that frustrate. One instance which might illustrate this is the section on mess tins. 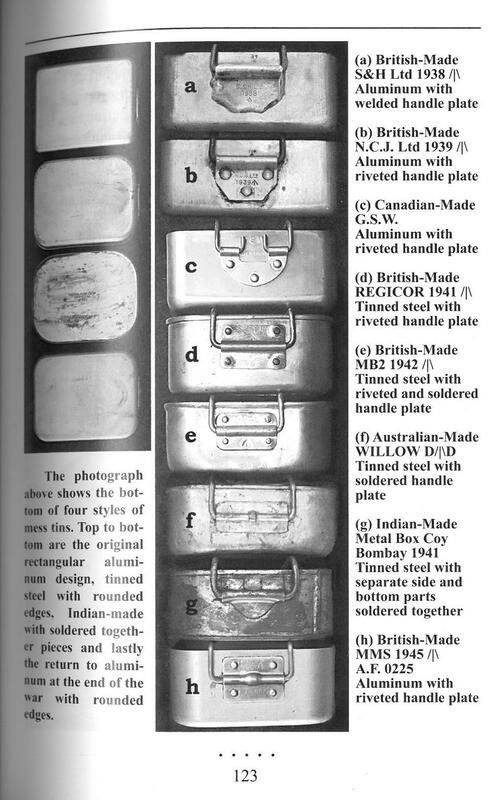 The two page spread has a lot of great pictures illustrating the difference between early war aluminium, mid war tinned steel and late war aluminium mess tins, it even has a section illustrating the different forms of securing the handle to the body of the tin: What is therefore frustrating is that, after going into such depth, the author doesn’t provide details of the rest of the mess tins used by British and Empire forces, no mention is made of D-Shaped, Cavalry or Indian oval aluminium mess tins. This is an example of where to me is where the book really falls short, it has a very uneven approach; covering some things in great depth, but ignoring other obvious areas. It also strikes me that a better focus would have done the book great favours, sections on documents and pamphlets and on gliders seem an odd fit with the nature of the rest of the items covered. In this case I feel the author would have been better leaving these bits out and instead concentrating on items more usually worn, carried and used by the Tommy. There are also odd additions, the section on water bottles has the usual 37 pattern cradles you would suspect, however there is no mention of the early aluminium bottles and for some reason a 1940 pattern carrier is included. Again this seems odd as there is nothing on the rest of the 1940 equipment and this seems as if the author just had access to one and decided to throw it in as it was a bit different and quirky. I suppose after this rather mixed assessment I am left asking myself if I am glad I bought the book, and despite my many frustrations with it, I am. Despite its limitations, the breadth of coverage within is superb and this is the only place you are going to find anything out about many of the pieces covered and the period photographs are superb, with many excellent Canadian ones I have not seen published before. Like all other books on the topic it should be read in conjunction with other sources and the reader’s own research, but it is an useful addition to the book case. I believe the book is now out of print but it is still available from Amazon here, however cheaper copies are also available from Soldier of Fortune. This entry was posted in British Army, equipment, Reviews, Uncategorized, WW2 on February 28, 2015 by hatchfive. 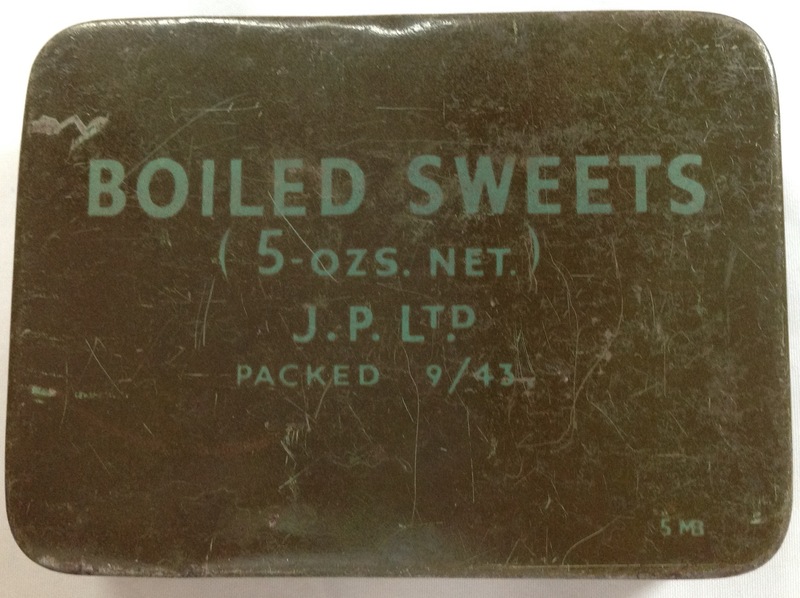 As can be seen this tin contained 5 ounces of boiled sweets made by J P Ltd and packed in September 1943. The tin is about the same size as many tobacco tins of the period and was designed to easily fit into a pack or pocket. At the bottom left hand corner of the tin is a combined ‘MB’ logo: This is the mark of the ‘Metal Box Company’, one of the largest manufacturers of pressed metal containers. The Metal Box Company Ltd could trace its history back to the nineteenth century and its antecedents had produced novelty biscuit tins and food containers. It had a convoluted history of mergers and acquisitions and it was only in 1930 that it became a limited company trading as ‘Metal Box Company Ltd’. When the Second World War broke out the company had just come out of the depression, but quickly geared itself up to make metal containers for the forces and various other munitions including Boyes Anti-Tank Rifles and Verey Pistols. By the end of the war the company had produced 140 million metal parts for respirators, 200 million items for precautions against gas attacks, 410 million machine gun belt clips, 1.5 million assembled units for anti-aircraft defence, mines, grenades, bomb tail fins, jerry can closures and water sterilisation kits, many different types of food packing including 5000 million cans, as well as operating agency factories for the government making gliders, production of fuses and repair of aero engines. This tin is made in two parts, a base and a lid which fit tightly together. Opening it up we can see that the inside of the two halves have been tinned to prevent rust: These tins are produced from one large sheet of tin stamped to shape in an industrial press to make each half without any joins or soldering required, this makes it much easier to ensure the tins are watertight. 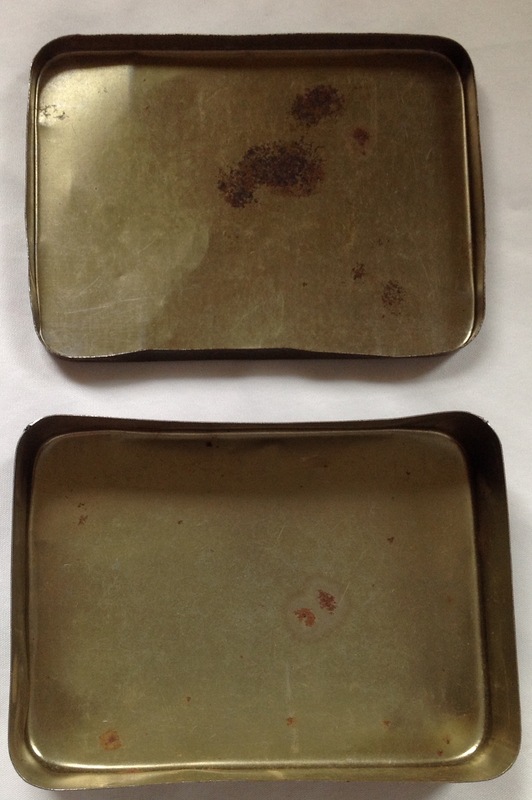 There are a number of similar tins available including one marked for boiled sweets, salt and matches and others for cigarettes. Larger tins are also available to be issued to a group of men. All these tins are quite scarce now and frequently fetch upwards of £40 each. 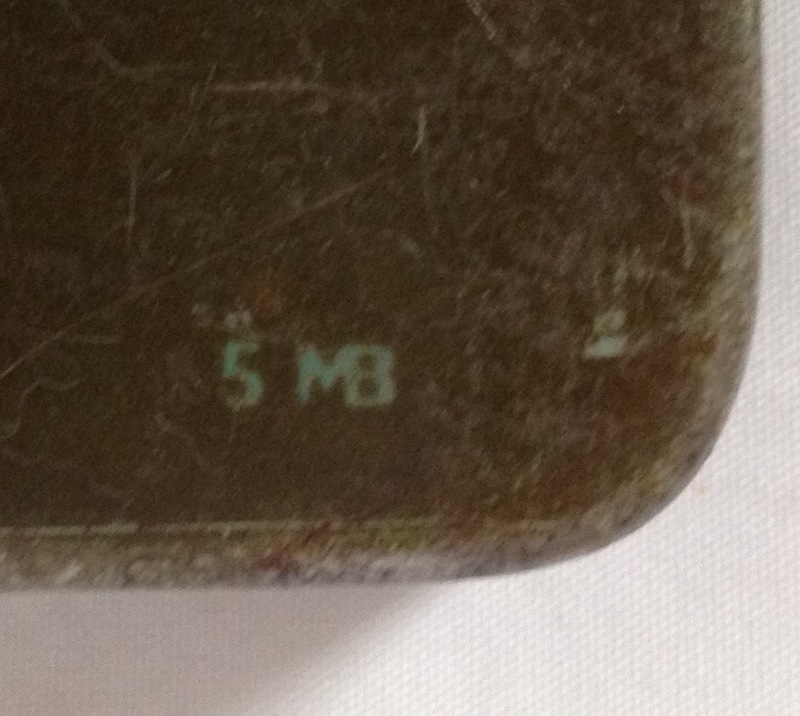 This entry was posted in British Army, equipment, WW2 on February 27, 2015 by hatchfive. I was commissioned in 1943 and attended the Military College of Science for 6 months, relieved to be back engineering after months of Infantry training. I specialized in pieces of ordnance — guns and heavy anti aircraft (AA) guns and was introduced to the R37, a radar controlled remote firing system. It was TOP SECRET and very effective against flying bombs, delivering 30 rounds a minute with great accuracy. There were only 20 of us qualified to install and maintain the R37 equipment being installed on the East Coast which was under enemy attack so I was not allowed to leave the UK until after VE day, despite being drafted to go on 3 separate occasions. The 3.7 inch calibre anti-aircraft gun was made in two forms, one mobile on its own undercarriage and the other static (Heavy), for use on prepared foundations on “permanent” gun sites. Initially, both types were aimed manually, one man turning a crank to elevate or lower the barrel, another to rotate the gun left or right. On static sites a tracking device (eventually, radar) measured the position and speed of the target aircraft and predictor equipment calculated the elevation and bearing to which the gun should be moved for its shell to hit the target. Each gun-layer had to turn his crank so that on the instrument in front of him he kept the pointer showing his elevation or bearing in line with a pointer set by the predictor. As aircraft speeds increased, accurate manual gun-laying became more difficult and eventually a mechanised system was designed and equipment developed which could be added to existing guns in the field. In the 1940’s this equipment was regarded as technically advanced and sophisticated, even secret. Highly skilled and experienced tradesmen would be needed and the work would require men of different traditional trades. The 37R Installation Detachment was created to carry out this work (I do not know when). It was an independent REME unit within AA Command and outside the existing REME AA Workshop structure. Its O i/c was a Captain who answered direct to the senior REME officer, a Lieutenant Colonel, at Command HQ. He had two Lieutenants each responsible for a number of mobile parties each with five men. People with suitable skill and experience had often achieved promotion and the result was the formation of a unit nearly “all Chiefs and no Indians”. Of a total complement of 65, 3 were officers about 36 were staff sergeants or sergeants and only 6 were without a stripe. 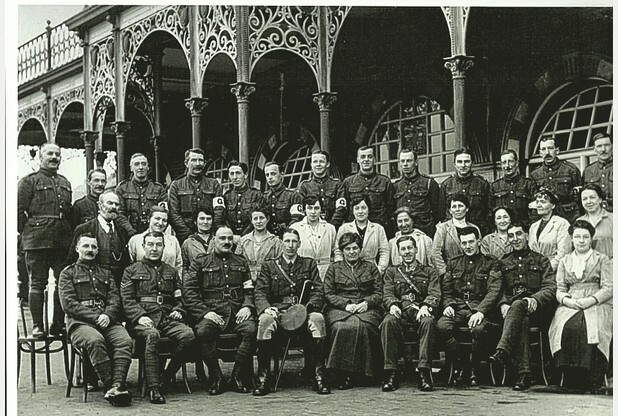 The unit HQ was at Golders Green, London NW11 and attached to No1 AA Workshop Company REME, its resident staff being the officers, a Cpl clerk and driver(s) for the Austin utility(ies). They arranged the deployment of the parties (and presumably, the 37R equipment) to the designated gun sites. Each party had its own 3-ton GMC truck, an enormous kit of tools and a good deal of independence. They were provided with accommodation and the facilities of the Royal Artillery unit whilst on site. At the time that I joined 37R, its role was changing from wholly to partly mobile. Six of the parties had been concentrated in a permanent AA workshop, No 6, at Wainscot near Rochester, to which the guns were brought (on transporters) from their sites and returned after conversion. This new way of working was more efficient and more comfortable. But it meant that the parties had to adapt to a loss of independence. For me at age 21, fresh from six months technical training, the presence of so much experience, so many arms-full of chevrons and crowns and such seniority of years, it was an eye-opener. To be joining them as their boss it was daunting! After several months the whole unit was brought together when we occupied part of the site of No 11 AA workshop at Wednesfield near Wolverhampton. As the war came to an end our numbers declined but the conversion of guns continued: they came in from sites but went out to storage areas — ready for the next war!! This activity continued until the unit was disbanded, I believe, in May 1946. During the last 5 or 6 months of its existence, the unit occupied a large workshop at Egington near Uttoxeter, vacated when an American Army Engineer unit was repatriated. Looking at the photograph we can observe that the sitters are NCOs and SNCOs with a captain sat at the centre: The rear of the photograph identifies him as a Captain Scott. There are also two ATS sergeants, presumably part of the administrative staff. 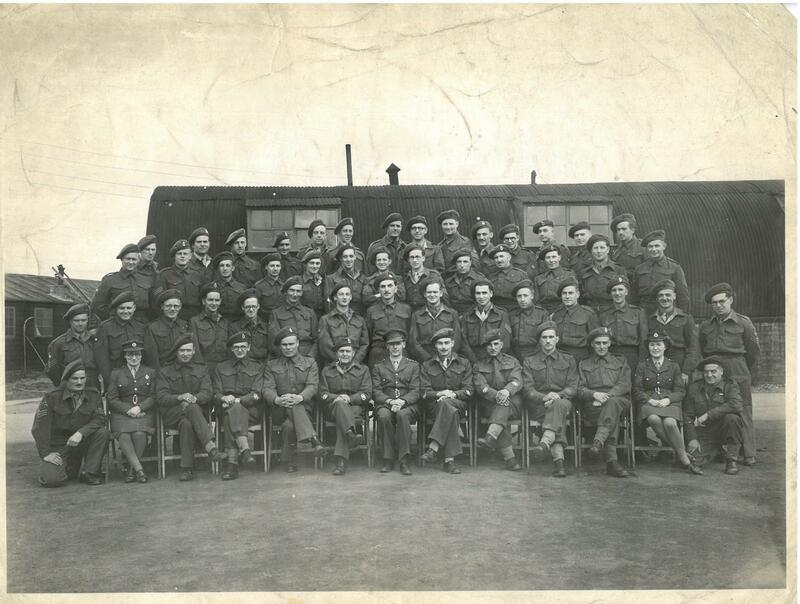 It is interesting to see that one of them has a REME pin badge attached to her uniform above the left hand breast pocket: The picture is dated June 1945 and all the soldiers are wearing GS caps, however there is a mix of brass and plastic cap badges: There appears to be around an equal mix of the two types of badge and this again is consistent with the late war period. This photograph shows how a simples inscription penned on the back can take you off into an interesting corner of wartime history, without it the photograph is merely another shot of a group of soldiers. This entry was posted in British Army, Photograph, WW2 on February 26, 2015 by hatchfive. 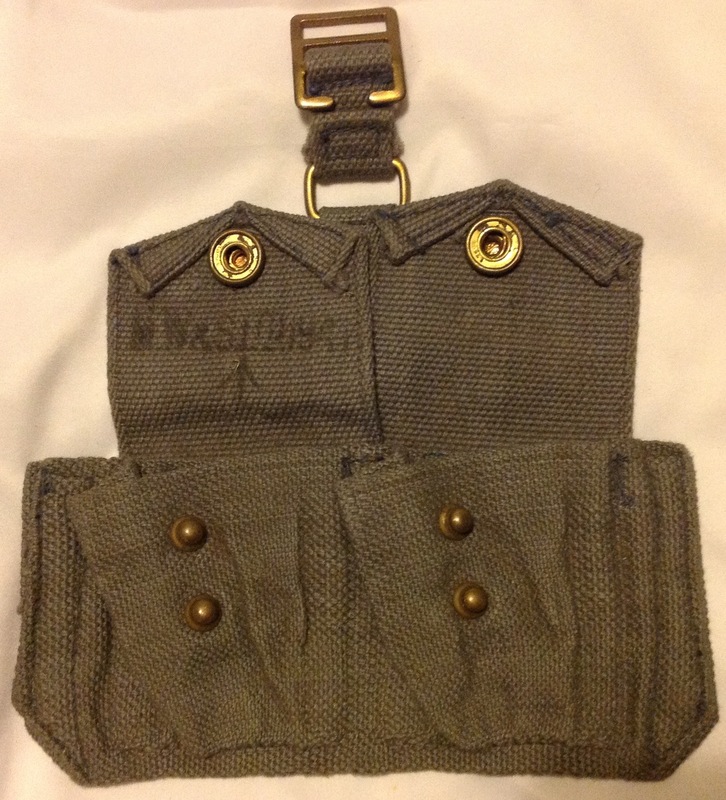 These are interchangeable and each comprise two pockets woven integrally: The interior of each pocket is divided by a partition into two compartments, each holding one clip of five rounds. 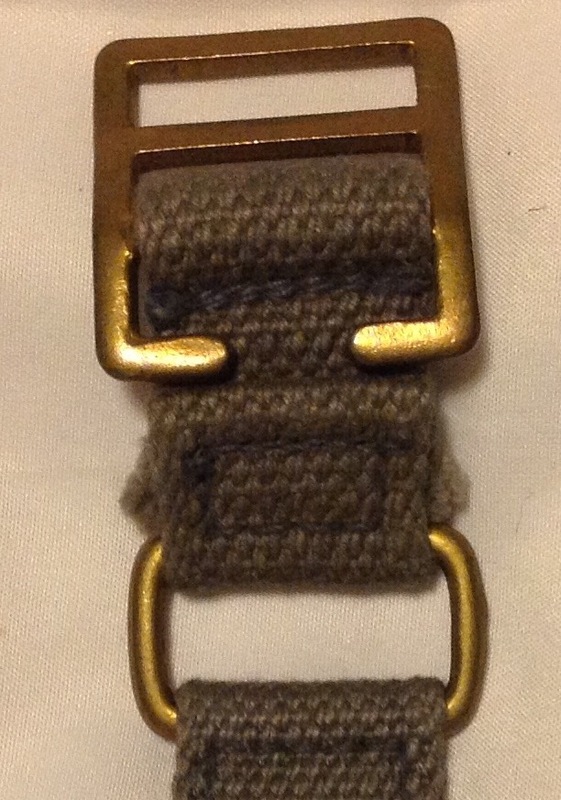 Flaps, with beaded edges, are secured by means of snap fasteners, the lower studs being used when the pockets contain only one clip or are empty: An extension piece of webbing is fitted centrally to the back of each to carry a buckle for connection of the braces: A brass link is provided below the buckle to enable the end of the brace to be passed behind the carrier: Two double hooks are fitted to the back of the carrier to connect it to the waistband: This set of carriers is marked MW&S indicating they were made by Martin Wright & Sons and dated 1941. The RAF introduced Blue grey 37 pattern in 1941 and many items date from this first batch. Like many items of RAF webbing they appear to be unissued and I have yet to see any contemporary photograph of the RAF using cartridge carriers, however as they were produced in blue grey both in the UK and Canada I assume some use must have been made of them. RAF blue grey 37 pattern webbing is very overlooked these days and many items can be picked up for less than half the price of their army equivalents. This entry was posted in Royal Air Force, Webbing, WW2 on February 25, 2015 by hatchfive. Only a couple of little finds on the second hand market this morning, but nice ones none the less. This tiny little tin measures about 1 ½” x ½” and is made of pressed metal with a hinged lid. Embossed on the top is the title NAVAL EAR DEFENDER: Originally this tin would have housed little rubber ear plugs for use by RN crews when firing the guns on board ship to help protect their hearing. It dates to the second World War when these ear plugs were personal issue items and unlike today’s soft foam rubber examples would have been made of a much harder India rubber. They were also designed to be used multiple times unlike modern disposable ear plugs, hence the tin to keep them safe and protected. 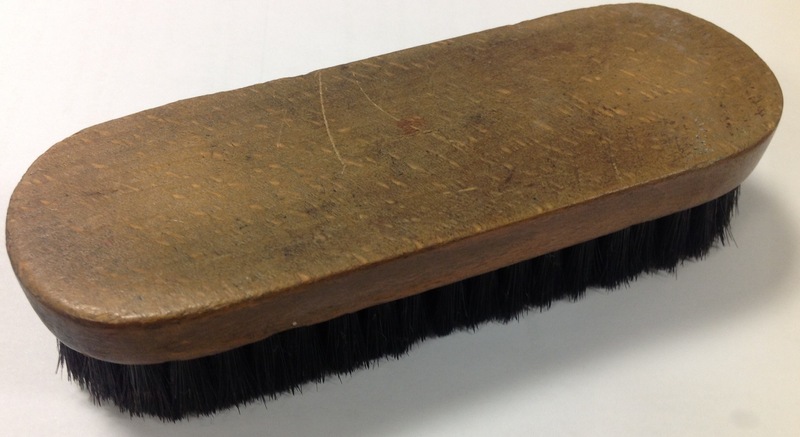 Once again I have gotten lucky and found a WW1 dated boot brush in a big tin of shoe cleaning equipment: This example is dated 1915 and was made by Vale Bradnack: Vale and Bradnack were two brush makers from Walsall. Walsall was the centre of British brush manufacture throughout the nineteenth and into the twentieth century. 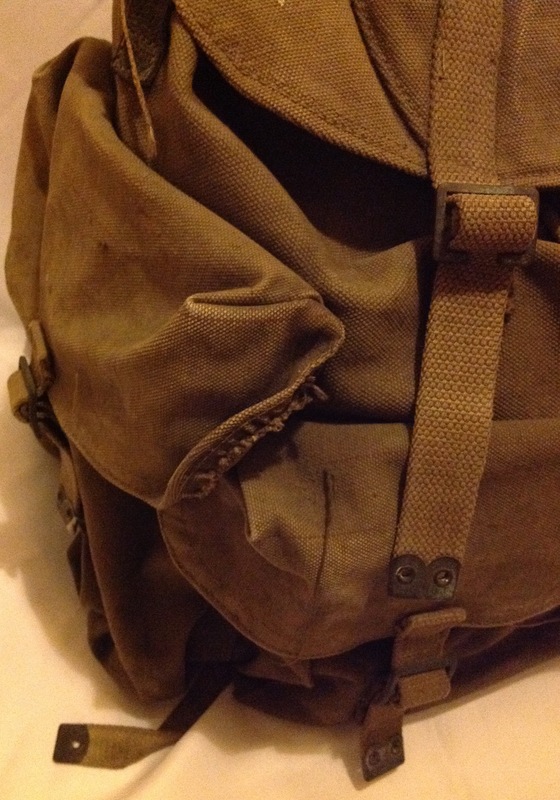 This entry was posted in equipment, Latest Pick Ups, Personal Kit, Royal Navy, WW1, WW2 on February 24, 2015 by hatchfive. To allow no one to supply the troops except approved firms of contractors. To fix the retail prices which were to govern the supplies of all contractors. To secure a flat rate of rebate of 10 percent from every contractor, or if the contractor had put up his own premises, then 7 ½ percent on his takings. 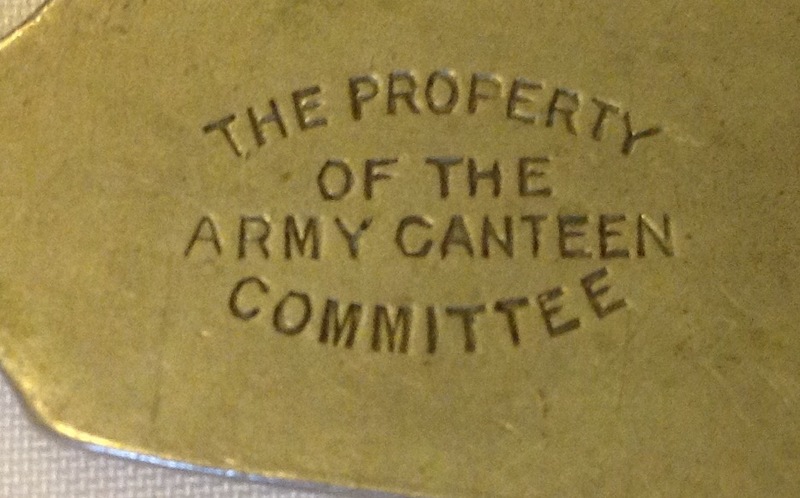 Despite these safeguards, the systems that had led to the creation of the Board of Control remained and in January 1917 the Army Canteen Committee was set up to oversee and run canteens for soldiers. The Army Canteen Committee took over the business of running canteens from these civilian contractors and it took over and subsumed many civilian contractors, the largest being Messrs R Dickeson & Co. By 1917 the Army Canteen Committee had over 2000 canteens under its control in the UK and it had taken over canteens in Gibraltar, Malta and Egypt. This fork is an example of those used in these canteens: As can be seen it is a ‘banjo back’ fork with the ACC logo in an oval stamped on the handle. Turning it over we can see details of its ownership: The Army Canteen Committee was very short lived, in June 1917 the navy asked to join the system and the committee was renamed the ‘Navy and Army Canteen Board’. This board would eventually become the NAAFI in 1921, still in operation today, providing food and drink to soldiers, sailors and airmen. As can be seen from the small window of operation, we can date the manufacture of the fork to between January 1917 and June 1917. 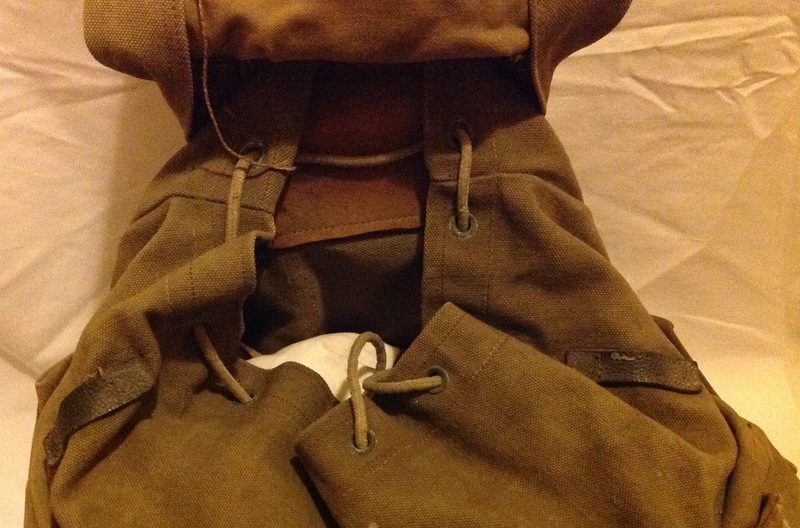 This entry was posted in British Army, equipment, Personal Kit, WW1 on February 23, 2015 by hatchfive. 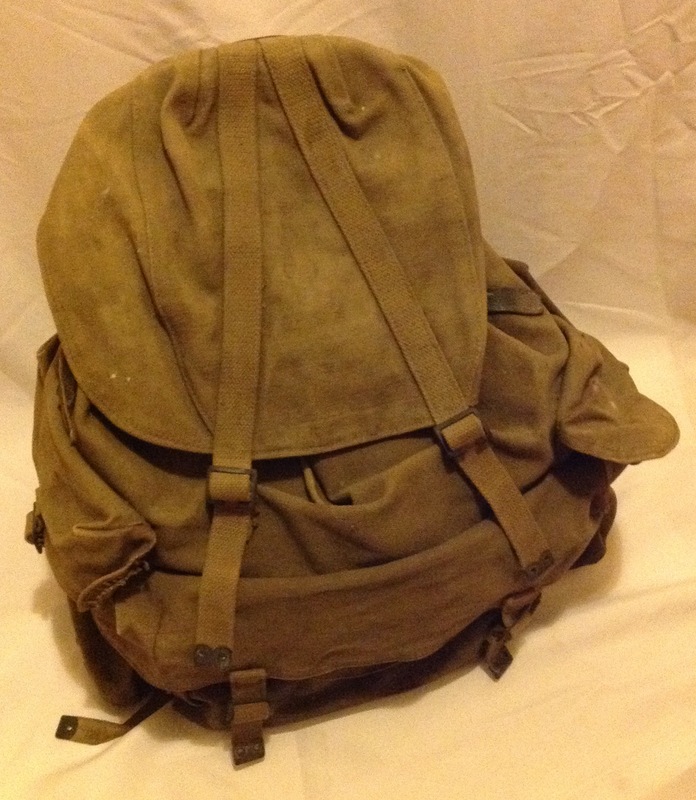 Tonight we are looking at a British made Bergen rucksack. 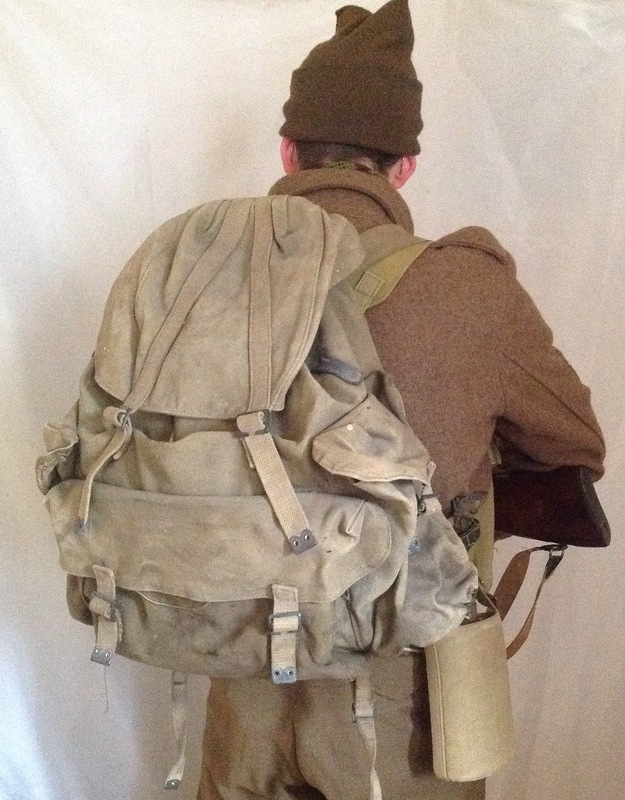 These rucksacks were developed in Norway before the war and variations of them were used by all sides in the conflict. 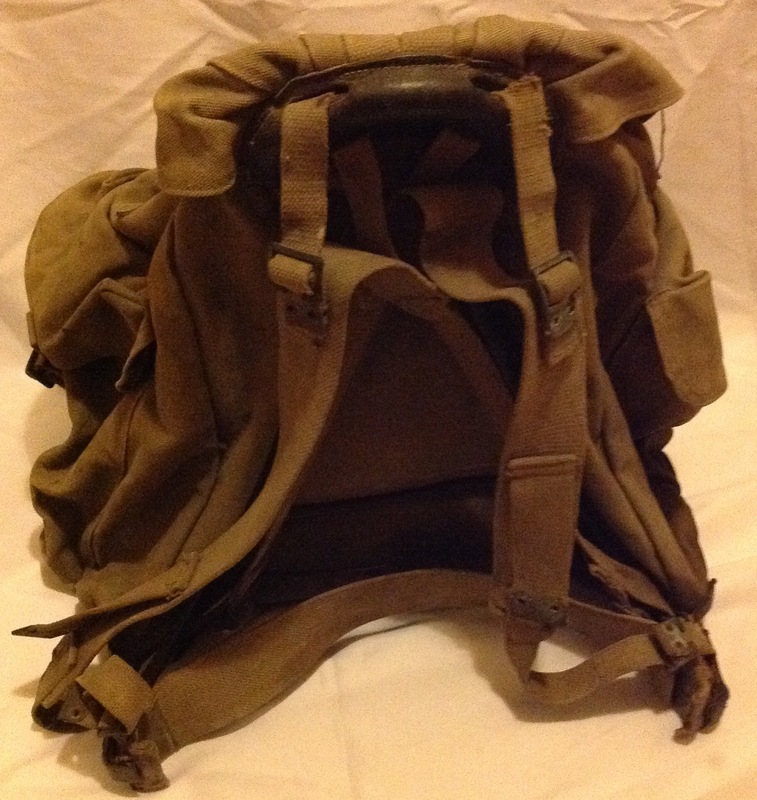 The use of the bergen is often associated with Commandos who made extensive use of them due to the large size and comfort of the pack: The bergen is built around a metal frame that allows the pack to sit high on the back, as can be seen from the rear, the pack is considerably larger than the normal 37 pattern small pack: The bergen has a large canvas body, with a flap that buckles over the top: There are two pockets on either side and a longer thinner one across the front, all secured with webbing straps and metal buckles: Lifting the top flap we can see that the main body of the bergen is secured with a drawstring: Under the lid of the bergen is a zippered pocket for maps and a /|\ mark and date of 1943: This example is made by D & M Ltd, unfortunately I haven’t identified who this stamp stands for. 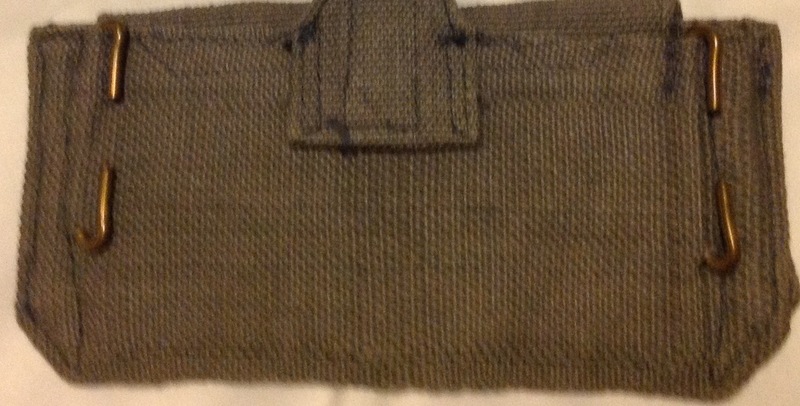 I am inclined to think it is most likely a canvas good manufacturer rather than a webbing manufacturer as most of the bergen is made of canvas, with only webbing fittings. Turning the bergen around we can see then innovative metal frame that characterises this style of carrier: The metal frame holds the main pack rigid and allows it to be worn high on the back, allowing the shoulders to carry a greater weight. The frame also curves around slightly at the front to stabilise the load. The webbing straps are designed to cushion the weight against the back to make it more comfortable, standing the back pack from the back also encourages the flow of air between the two offering greater comfort. Sadly the leather fastenings at the base of the A-Frame have perished on this example. 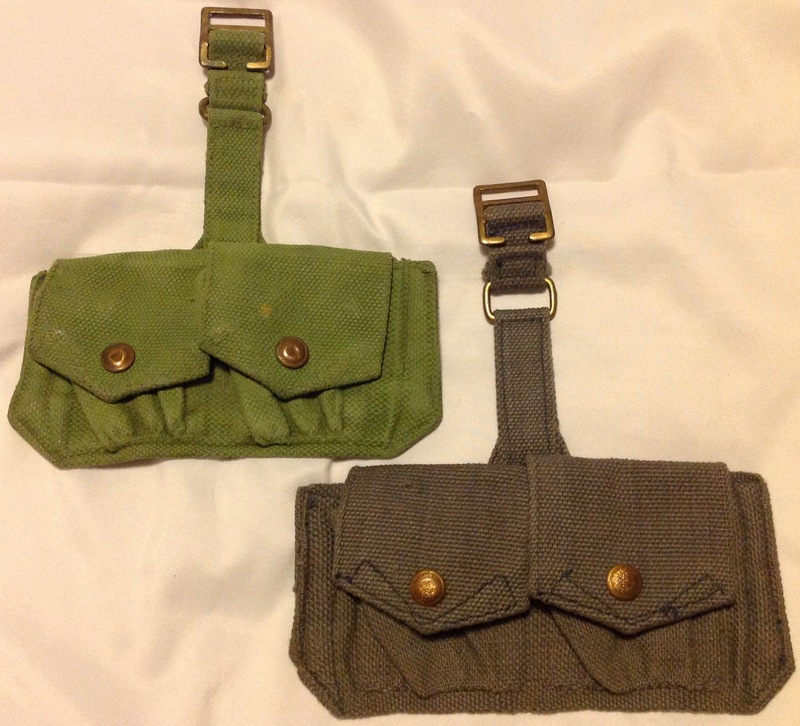 These bergens were produced throughout the war and from similar components after the war for the civilian market, using surplus shoulder straps. 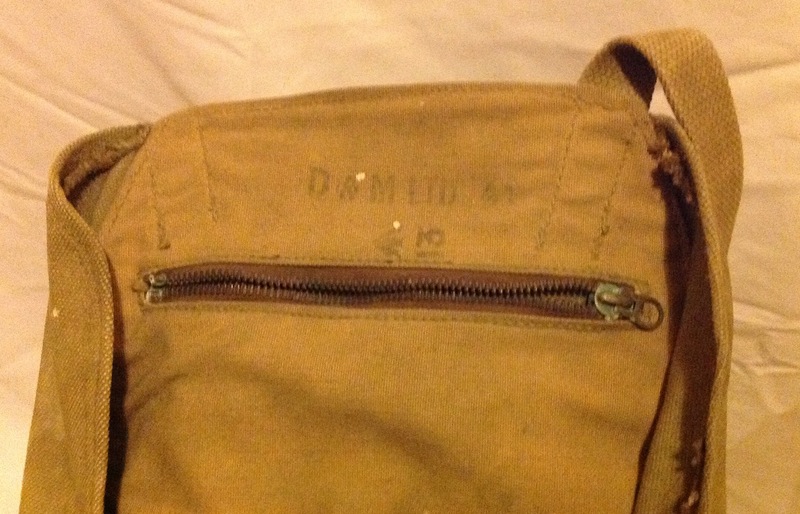 Unfortunately therefore, even if the carrying straps are WD marked and dated this is no indication that the bergen is a wartime issue military one. 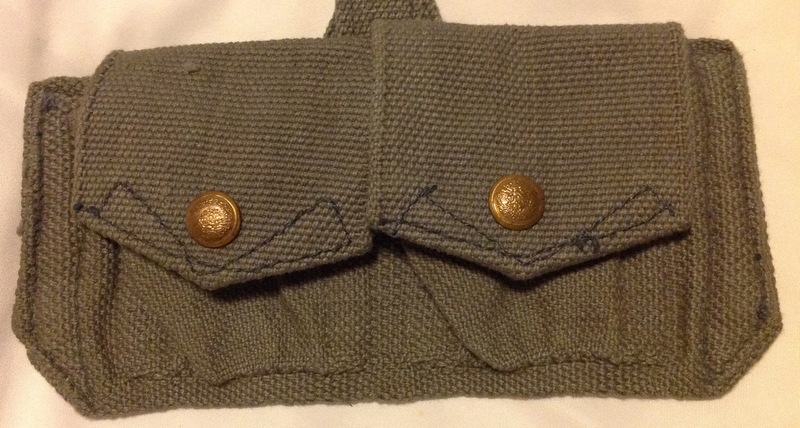 The best markings to confirm military production are those under the top flap like this example. 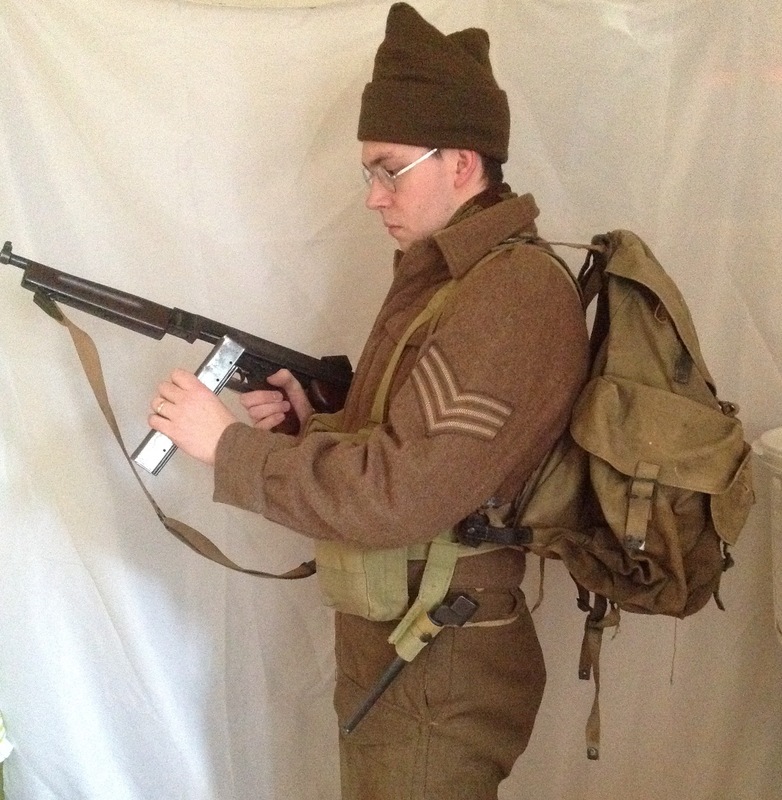 This entry was posted in British Army, equipment, Webbing, WW2 on February 22, 2015 by hatchfive.